Army Private Hannah Foraker hadn’t ever really left home for a long period of time before until she went away to boot camp for three months. 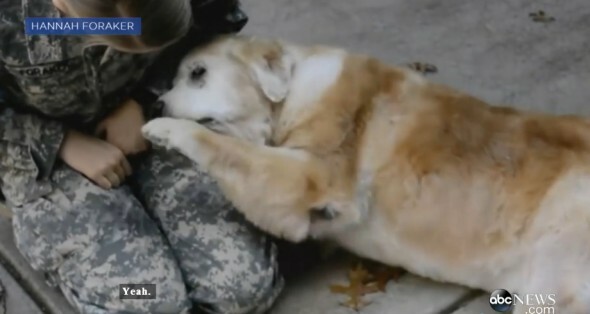 When she returned, her elderly dog Buddy gave her quite a welcome. Buddy became a bit of a shadow for the next two weeks while Foraker was home. She followed her everywhere she went, and seemed to show an energy that was reminiscent of her younger years! Buddy is a senior dog, and she is suffering from hearing loss and arthritis. However, Foraker and Buddy do get to keep in touch via Skype while she’s not home. Dog Misses Acting Queue, Nails it Anyway! For some, the waiting never ends..
Oh goodness ,thats pure love right there,can tell the dog is old and how she loves her mommy is priceless,shes still her baby? I believe animals are very capable of loving, feeling and crying. They have spirits! I will always believe that they go to heaven! Wow. Stories like this bring instant tears! ? You haven’t lived until you have been the recipient of a dogs’ love..
Our love!!!! It’s so beautiful. 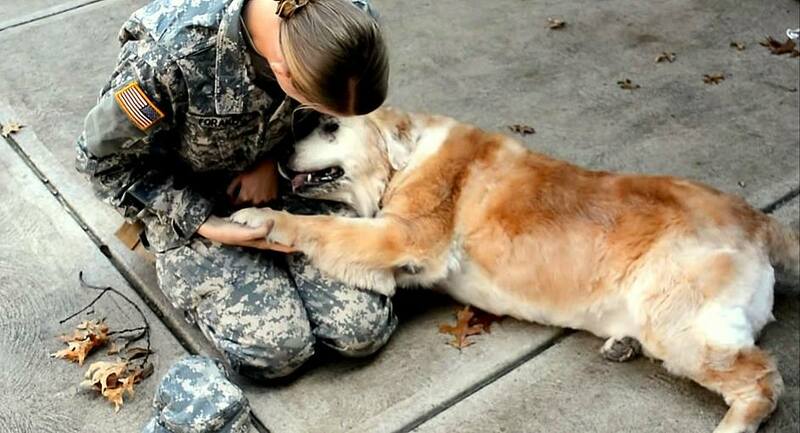 Unconditional love! And we put thousands of them down everyday. If this doesn’t prove that they have feelings, memory what does? Aaawww so beautiful! Our love and devotion! ❤? So, so sweet! That is the same voice I used for my sweet, old girl. It’s funny I don’t use the baby voice for babies, but I do use it for doggies. Dog lover for life! Such beautiful & loving creatures. They are a blessing to us humans. so sweet.. I don’t think I’d be able to leave my elderly dog for that long. I’d be too worried about her. It’s a touching story. But if your in the mood to be totally frustrated with a faulty webpage, go to this link. Enjoy. I hope that is true . Lovely history . Blessings and thanks for your. service . Looks like a Golden senior citizen. Gotta love those Goldens.